The Chicago area will be well represented at WEC 53 in Arizona on Thursday night — the last ever WEC event before the full absorption of the WEC into the UFC. Here’s a preview of the three local fighters that will do battle. Although the lightweight division is packed with the merger, a win against Shalorus surely gets Bart a solid opponent in his first official UFC fight. He already told us he would like to fight Kenny Florian, but maybe he’d like to avenge a loss he suffered at the hands of another local fighter all the way back at XFO 6: Clay Guida. Wouldn’t that be something? Duneland Vale Tudo and New Breed Jiu Jitsu’s Eddie Wineland will be a part of two pieces of WEC history after Thursday night. He was the WEC’s first Bantamweight Champion and he will have fought on the last ever WEC card. 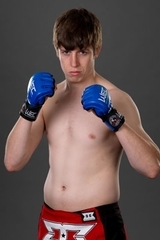 He’ll get WEC first-timer Ken Stone in the prelims. Wineland injured his shoulder and has to pull out of his fight with Damacio Page, but he told NWI.com’s Matt Erickson that he’s doing great. Wineland has won 3 straight and 5 of his last 6. He’s also extremely eager to get back into contention for the Bantamweight title. Duke Roufus-trained Dan “Danny Boy” Downes was born and raised in the Mount Greenwood neighborhood and is an honors grad of St. Ignatius High School and Marquette University. He fights out of Milwaukee and the Duke Roufus camp. In his debut at WEC 49, you might say that Downes was thrown to the wolves. He was fighting Chris Horodecki in his hometown and he took the fight on short notice. He gets a different kind of wolf this time. Downes will be battling China’s Tiequan “The Mongolian Wolf” Zhang at WEC 53, with the fight televised all across China. Zhang is unbeaten in 17 fights, including a first-round submission win over current UFC fighter Pablo Garza in his WEC debut back in September. The China Top Team fighter is the first from mainland China to fight in the WEC. A win over Zhang will be huge for Downes. This time he has had a full camp and his father told Chicago’s MMA that Danny says he is in the best shape of his career. Watch WEC 53 live on Versus at 8pm central.